This card is based on the flying broomstick from The Wizard of Oz and the Scimitar Sith Infiltrator from Star Wars. This is the first Kozmo card to become Limited. "If this card is Normal or Special Summoned: You can target 1 monster on the field; destroy it." is a Trigger Effect. (It's an effect that targets 1 monster on the field, it can also be activated during the Damage Step.) :"Kozmo Dark Destroyer"
When "Kozmo Dark Destroyer" is Summoned by "Ultimate Offering" or "Call of the Haunted" as Chain Link 2 or higher, you can activate its Trigger Effect in a new chain. The monster effect, ""Cannot be targeted by an opponent's card effects."" is a Continuous Effect. "Special Summon 1 Level 7 or lower "Kozmo" monster from your Deck." is not an effect that targets. (At resolution, you choose 1 "Kozmo" monster to Special Summon from your Deck.) If you do "NOT" have a Level 7 or lower "Kozmo" monster in your Deck, you cannot activate this effect. 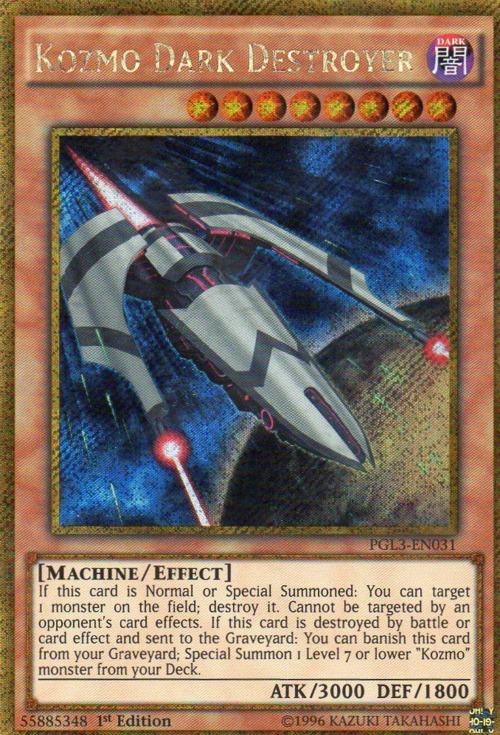 Even if "Kozmo Dark Destroyer" is destroyed by a card effect and sent to the Graveyard as Chain Link 2 or higher, you can still activate its Trigger Effect.